The Southern Cliffs of Lydstep Haven Bay . 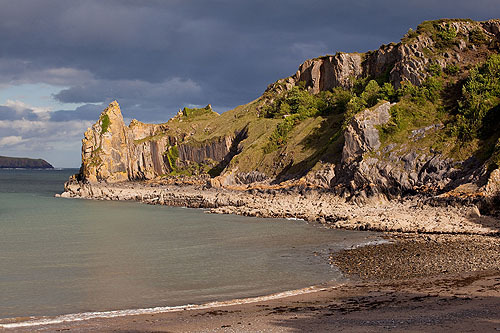 Boats were loaded here with limestone and despatched to other parts of Wales and North Devon. Views to the East - St Margaret's Island / Caldey Island and the Cliffs past Proud Giltar to Giltar Point . The Coastal views are impressive , even though this area is dominated by "Lydstep Beach Village" , a Haven Leisure Holiday Park .